Goodbye to all that: No more sticks. No more scans. © Laurie Frost and HaveaLittleTalk, 2009-2016. Unauthorized use and/or duplication of this material without express and written permission from this site’s author and/or owner is strictly prohibited. Excerpts and links may be used, provided that full and clear credit is given to Laurie Frost and HaveaLittleTalk, with appropriate and specific direction to the original content. Who Knew a Photographer from Getty Images Went to the Moon? So how does Getty Images get away with licensing pictures from the moon? Wouldn’t “other rights”include licensing? Maybe the judge reviewing the Carol M. Highsmith case can cast some light on this. Now go to Google and search for “Apollo 11 Images.” Click through any of the image results that specify NASA.gov as the domain, and it won’t be long before you will find your way to the Apollo Archive of NASA, where there are 724 images for Apollo 11 alone. All three of these pictures, and many more that Getty is trying to license for use at $575.00 a piece, are available to download free at the Apollo Archive. The astronaut is Aldrin. Control number at NASA is AS11-40-5903. The bootprint’s NASA ID is AS11-40-5877 or AS11-40-5878. The moon (“view of full lunar disc during return trip”) NASA ID is AS11-44-6667. Cost to download these images from NASA: = $0.00. A few weeks ago, I posted “The Audacity of Getty Images: Exploiting Carol Highsmith, America’s Photographer” about the way Getty Images took from the Library of Congress thousands of images placed in the public domain by “America’s photographer” Carol Highsmith. Her intention was that Americans could use them without paying a cent. Getty downloaded these images from the Library and then uploaded them on its own site, Getty Images, and charged licensing fees for using these pictures, which belong to them no more than they belong to me — or you. To add insult to injury, Getty Images listed itself/Carol Highsmith as these works’ creator, which suggests that she was in cahoots with them, notwithstanding that Highsmith first learned of this scam when she received a threatening letter for not paying licensing fees for the privilege of using her own pictures on her own website. Then I wondered: if Getty Images is pretending that they have the right to demand payment for the use of Highsmith’s photos, could they be pulling the same scam with other images in the public domain? It took less than an hour to establish that Gettying extends beyond the Highsmith experience. Consider these 2 pictures of ships. What’s the difference? Unless you want to place it in an advertisement, using the first image is free — no licensing, no permissions. In contrast, this photo, the one with “gettyimages/ US Navy” will cost you $575 to use. Even the caption at Getty is plagiarized — stolen — from the US Navy. KEY WEST, FL – OCTOBER 5: Nine ships from the Royal Bahamas Defence Force, research vessel Walton Smith and a contract vessel take shelter at Naval Air Station Mole Pier as Hurricane Matthew approaches October 5, 2016 in Key West, Florida. NAS Key West is not currently projected to be in Matthew’s path and as such, stands by to support other services and relief efforts. NAS Key West is a state-of-the-art facility for air-to-air combat fighter aircraft of all military services and provides pierside support to U.S. and foreign naval vessels. (Photo by Cody R. Babin/U.S. Navy via Getty Images)”. Notice: U.S. Navy photographs and digital images on this site are fully released by the U.S. Navy. If used for news and information purposes please credit as “U.S. Navy photo by [photographer’s name].” The use of Navy images for advertisements must be specifically approved by the Navy Office of Information (OI-2) prior to the use. Write to navymedia@navy.mil and include details on your intended usage. In other words, unless you want to use the picture of the ship at Key West in an advertisement, you are free to do so for free. The idea is that since the military is supported by tax dollars, you have already paid for this picture. And let’s be clear about this: Mass Communication Specialist 3rd Class Cody R. Babin is not working for Getty Images. He is not paid by them. He works for us. Really, he ought to protest the use of his name by Getty because were he on both their payroll and the Navy’s, he would be double-dipping. Yes, I suppose it is nice of Getty to acknowledge him as the creator of the work — but do you think he will see one thin dime of the $575 licensing fee Getty is charging for — well, for what? Next up: Gettying NASA photos and historical images from the Library of Congress. Highsmith has provided the Library of Congress with 31,828 images (as of today, 8/18/16)– and has stipulated that they be placed in the public domain. The Library expects that number will likely approach 100,000. I was astounded to find an outstanding contemporary photographer’s work could be freely used. No licensing fees are required to use her images, but there should be a credit line, at the least identifying her as the Creator of the work, and preferably using this Credit Line: Library of Congress, Prints & Photographs Division, photograph by Carol M. Highsmith [reproduction number, e.g., LC-USZ62-123456]. After I posted the first time about Highsmith, I learned she was seeking sponsors for an ambitious project, photographing every state so that a record may be had of what America looked like in the first decades of the 21st century. I’ve been following her progress since she started with Alabama, with sponsorship from philanthropist George F. Landegger. You can imagine how appalled I was to read about the gross exploitation of Highsmith’s generosity by Getty Images. In December 2015 Highsmith received notification from Alamay Ltd.’s License Compliance Services (LCS), (on behalf of Getty Images) demanding $120 because she was in breach of Getty’s licensing terms for the content of an image she had used on her website and accusing her of copyright infringement. The image in question: one of Highsmith’s own and one she placed in the Library of Congress with the stipulation that it be placed in the public domain. Apparently, Getty Images had been downloading her thousands of images, placing them on its site, and demanding licensing fees, as if Getty owned the images. In other words, they were doing exactly the opposite of Highsmith’s intention, which is to allow free use of her images. Using her images is not the same as owning her images. Getty had 18,755 of Highsmith’s photos on its site. The way this all came to light was because Getty “scrapes” the net, looking for uses of its images and checking license fees have been paid. Eventually the scraper hit Highsmith’s website, and the scheme was exposed. Perhaps if Getty had been careful to credit Highsmith as the photographer, they would have realized sending Highsmith a threatening letter wasn’t a good idea. Highsmith has filed a $1 billion dollar suit. Sullivan expects Getty will settle out of court. A prediction: when she wins, Highsmith’s life will change in one way. She won’t have to seek sponsorships to make it possible for her to work night and day, and this means she’ll have more time to document America. You can follow Highsmith’s travels on Facebook (Carol M. Highsmith’s America). I first wrote about Carol Highsmith two years ago when I asked, Is Carol M. Highsmith the Most Generous Artist of Our Time? after coming across her archive at the Library of Congress’s Prints and Photographs Online Catalog and learning that eventually she will have provided the public an estimated 100,000 images for their personal, educational, or commercial use — all for the price of a credit line. Then last year I told you Carol Highsmith was in Alabama, working on a project for the Library of Congress, the 21st Century America Collection. Her goal is to document in digital images life in each state so that future generations will have an idea of what America was like in the first decades of this century. She was able to get going on this project because of the generosity of businessman and philanthropist George F. Landegger, who funded the Alabama collection. Carol spent much of 2010 traveling over 20,000 miles up, down, across, and around the state of Alabama, and now the George F. Landegger Alabama Library of Congress Collection is completed and up for your viewing at the Library of Congress. Now Carol is hard at work with the 21st Century America Foundation, Inc., a “priority initiative” of the Library of Congress, looking for funding to get to work on her next state. Which one remains to be seen, but I’ll let you know as soon as I can. Meanwhile, time for the pictures. Credit lines for each image should read: The George F. Landegger Collection of Alabama Photographs in Carol M. Highsmith’s America, Library of Congress, Prints and Photographs Division. 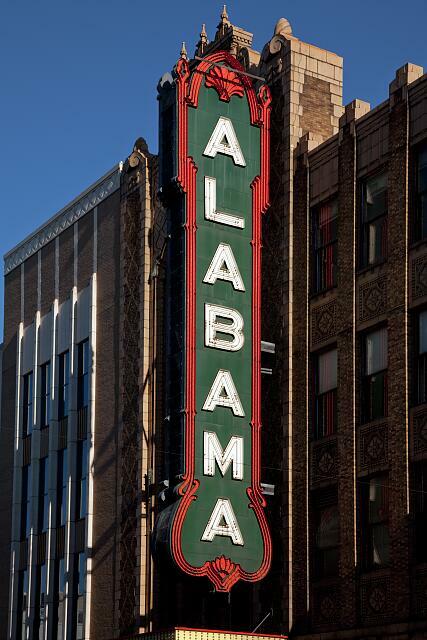 The Alabama Theatre was built in 1927 by Paramount Studios in Birmingham, Alabama as a showcase for Paramount films. At the end of March, I told you that photographer Carol Highsmith was in Alabama, working on a project for the Library of Congress, the 21st Century America Collection. Her goal is to document in digital images life in each state so that future generations will have an idea of what America was like in the first decades of this century. These images will be copyright free, donated to the Library of Congress and placed in the public domain (see Is Carol M. Highsmith the Most Generous Artist of Our Time?). Now I can show you what Carol Highsmith has been doing these past weeks. Make a detour over to 21st Century Alabama, where you’ll find over 200 of the 4,000 images she’s making (and remember, she arrived in February, just weeks ago: this woman works). Later this year, probably late summer, you’ll be able to find the George F. Landegger Alabama Collection on the Library of Congress site, as well. The photos in this post are a few examples from her Alabama shoots. Why is it called the George F. Landeggar Alabama Collection? And who is George F. Landeggar? Don’t assume that Carol started this massive project in Alabama because it comes first in an alphabetized list of US states: you would be wrong. She’s in Alabama because of the generosity of George F. Landegger, who is funding the Alabama collection. I did a little googling and discovered that Landegger is, like Carol Highsmith, an admirably generous man. Where in America is Carol M. Highsmith? You may remember my post from last year, Is Carol M. Highsmith the Most Generous Artist of Our Time? about the photographer who for nearly twenty years has donated her work and assigned her rights to the Library of Congress, and placed it in the public domain, making it available to the public for their personal, educational, or commercial use all for the price of a credit line. Who Was Dorothea Lange’s Migrant Mother? While I plan to post henceforth on public domain images on Public Domain Images Online, I’m posting a bit of this one here since it follows up on a havealittletalk post from this spring. In an earlier post I noted that one of the most famous American photographs of the twentieth century is in the public domain in the United States since it was taken by Dorothea Lange when she was employed by the Farm Security Administration during the Great Depression. What came to be known as “Migrant Mother” was one of six images shot by Lange on March 9, 1936 near Nipomo, California, where migrant workers were in a dire situation since the crops they had come to harvest had been destroyed by freezing rains. Polar bears attract my attention these days since I am a big fan of Iorek Byrnison, king of the armoured bears of Svalbard, and one of the few admirable adults in Philip Pullman’s His Dark Materials and Once Upon a Time in the North. Now, armoured bears aren’t polar bears — after all, they wear armour and talk, for starters — but in our world polar bears resemble them in a few ways: both are left-handed and both are formidable and intimidating, in or out of armour. I was hastily scrolling through one of those Fwd: Fwd: Fwd: emails of unusual pictures, when I stopped at an image of a polar bear and what was identified as a — submarine! 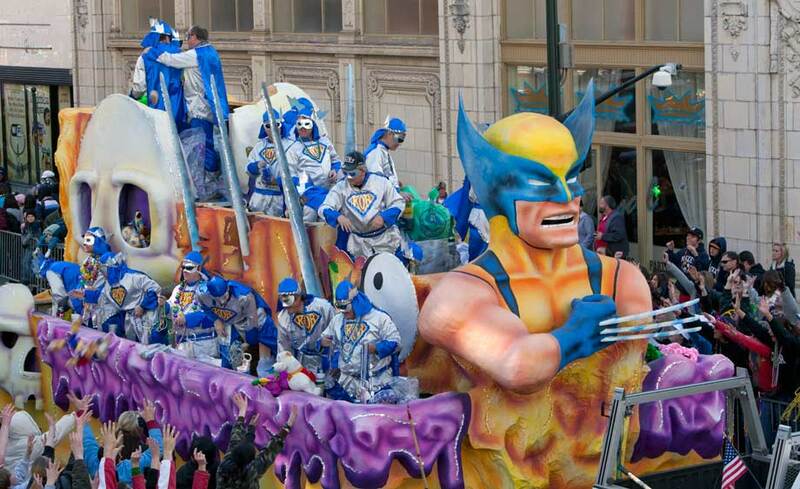 I keep hoping that the economic stimulus plan will include funding for the arts, but I haven’t seen any sign of this. In contrast, one of the legacies of the New Deal’s Works Progress Administration are the iconic American photographs by Dorothea Lange [“Migrant Mother”], Arthur Rothstein [“Farmer and sons walking in the face of a dust storm”], Walker Evans, and others as employees of the Farm Security Administration, a New Deal Department of Agriculture agency, which means their works are in the public domain. You can see these here. Once again we return to the Library of Congress’s Prints and Photographs Online Catalog, this time to look at a few of the 907 WPA posters advertising events supported by Federal funding or created as public service announcements between 1936-1943. A brief history of arts funding in the WPA is provided as well. Many deal with health and World War II; others promote domestic tourism, using libraries, and so on. Here’s a sampling, with credits listed at the bottom of the post. links fantastic: Theatrical Posters in Public Domain. And Dastard. Library of Congress’s Prints and Photographs Online Catalog, this one a collection of some 2100 performing arts posters. Most date from 1879 to 1910, so they are in the public domain.